A typical week-long eastern Caribbean cruise includes San Juan, Puerto Rico; St. Thomas, USVI; Antigua; Tortola, BVI; and Nassau, Bahamas. Here are some impressions, tips and warnings in case you are planning to continue summer or flee winter by cruising south. Arrival a little before 5 p.m. and departure at midnight didn't leave much time for sightseeing, but I had a mission. I wanted to see the cathedral where Ponce de Leon, "discoverer" of Florida, was buried and sample a Pina Colada at Barrachina Restaurant, where the drink was supposedly invented in 1963. Tip: Having a mission - something to see, find or do - at a destination livens up a trip. Even if it proves less than memorable, getting there and back usually is. A $7 cab ride - they give printed receipts! - took me to a high spot - literally - in Old San Juan, which turned out well because everything else was downhill. One mission accomplished, I headed to Barranchina, a pretty if touristy place to idle where the bartender was from New Jersey! Warning: Don't gawk and walk at the same time. Sidewalks and streets in scenic Old San Juan are cobbled, cracked and anything but level. 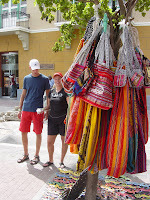 See what I mean about uneven surfaces .... image courtesy of Puerto Rico Tourism Co. I come by that advice firsthand. I did try to walk and gawk, took a bad spill and had to spend the rest of the night on board RICEing (Rest, Ice, Compression, Elevation). It did, however, require hitting another fun place, Puerto Rico Drug Co., est. 1850, a 9,500-square-foot emporium of rum, cold beer, groceries, electronics, souvenirs and, whew, Ace bandages. Tip: If the Duty Free shop in the ship terminal is having a sale, don't miss it. Bought a bottle of my favorite perfume for half of their price. "Bustling" is the word for this port, "shop, shop, shopping" for its downtown. We took a three-hour excursion to an overview from which we saw Charlotte Amalie, capital of the Virgin Islands; to the Northside for a look at Drake's Passage; to Mountain Top, supposedly home of the banana daiquiri, then to Emerald Beach for lunch and, as it turned out, a wedding. That left all afternoon for shopping - the ship departed at 6 p.m. - but I found the prices a bit high. With three other ships in port, it was crowded and perhaps the merchants had made enough sales they didn't have the incentive to bargain. Tip: The island is mountainous so see it by safari van. They'll drop you off downtown, which is flat, and you can take a jitney to the ship terminal. Don't forget, though, there is invariably a hefty hike before you reach yours. If you are tempted to take a boat excursion or try out a water sport, this is the stop to do it. This is the place for history buffs. Antigua was the Caribbean base for the British Royal Navy in its heyday; Admiral Lord Horatio Nelson met Lady Hamilton here. Most van tours hit the high - literally - spots, Dow's Hill Visitors Center, the Blockhouse and Shirley Heights Lookout. The views are great but save yourself for Nelson's Dockyard, the world's last Georgian naval dockyard still in use. History comes alive in these fascinating buildings. You'll want to wander the docks, too, where today's well-heeled sailors tie up. Tip: Antiguans are sweet, even when you tell them no. Found the best prices here, too. Head back to the ship early enough to sit at a cafe near the terminal entrance, sip a cool beverage and watch the street performers. Between their antics and those of returning cruisers, it's the best entertainment in town. This may be the dearest, sweetest island of them all. We took a four-hour excursion around the island with Elroy, owner, driver and raconteur of Elroy's Pleasure Tours which again, hit the high-up spots. He told us the island was named for its turtle doves, not sea turtles, that the frequent speed bumps were called "silent policemen" and described Bomba Shack, a jumble on the side of a cliff that had been thrown together from hurricane debris, as the island's "most powerful restaurant." After the 2008 hurricane season, it was probably blown down but I hope it has been re-assembled. Tip: If your ship, like ours, arrives in the morning and leaves mid afternoon, you won't have time to tour the island and shop downtown. If you can snag Elroy, tour. Of all the islands we hit, this is the one I'd go back to first. Winds kept us from docking in Nassau, but having been there before I really didn't miss it. There are a few fun things to do, kids love to tour and swim at Atlantis on Paradise Island and you can finish any leftover shopping, but relax on a beach or enjoy the ship is my recommendation. Tip: There are an ocean's worth of bargains out there this time of year, especially in the Caribbean, but make sure you pin down in writing exactly what the cruise line's policy is on hurricanes, tropical storms and/or missed ports. This is a good time to consult a travel agent. You'll save money in the long run. Peaches are in and it's been a great year for the summer fruit. Having traveled to and helped judge this year's Peach-Off in Laurens, SC, I want to share some of the great peach recipes I encountered in the second largest peach producing state (California ranks first). That area of S. C. is nice and level so it kind of fits - if you stretch it and since this is my blog I'm going to. small towns that so many think of as idyllic - as if anything really were for long. Now on to the peaches and recipes. First off, at a luncheon, Chef James Patterson, the genius behind the food at Musgrove Mill Golf Course, served the judges a scrumptious appetizer - slices of peaches, each with a sprig of mint, wrapped in prosciutto and offered from a platter lined with a balsamic reduction. Winner for creativity among the Peach-Off's professional entries was the punch developed by Jason Bundrick, owner of Jacobs Highway Study Club. Peel, pit and puree 4 ripe peaches with 1/4 Cup of sugar. Preheat oven to 375 degrees. Line 9 x 13-inch pan with croissant dough and bake for 6-8 minutes. Remove from over and evenly distribute the Havarti cut into 1/2-inch cubes. Cover with more croissant dough to form top crust. Bake 12-15 minutes until dough is brown and cheese has melted evenly. Dice the peaches and glaze over low heat with the syrup (about 8 minutes). Evenly pour peach mix over dough. Sprinkle with slivered almonds to garnish. 4 large peaches, peeled, halved & pitted; reserve one for garnish. Preheat oven to 350 degrees. Line baking sheet with parchment paper. Toss 3 peaches, sugar and honey in a large bowl. Place peaches, cut side down, on prepared sheet. Roast 15 minutes, turn over and bake until tender and juices begin to caramelize, about 10 minutes longer. Scrape peaches and juices into food processor and cool; blend until smooth. Add orange juice, cinnamon and salt; blend until smooth. Transfer soup to medium bowl and season to taste with lemon juice. Cover and refrigerate until cold. Place creme fraiche in small bowl. Scrape in seeds from vanilla bean halves and mix well. Ladle soup into 4 bowls; top with dollop of vanilla cream. Garnish with peach slices and mint sprigs. My favorite among the many amateur entries was the winning side dish from the aptly named Ellen J. Cook from McCormick, SC. Preheat over to 350 degrees. Spray bottom of loaf pan with non-stick cooking spray. In large bowl combine flour, sugar, cinnamon, baking soda, baking powder, salt and nutmeg. Add remaining ingredients and stir until dry ingredients are moistened. Spoon batter into pan. Bake 65-70 minutes or until wooden pick inserted in center comes out clean. Remove loaf to cooling rack and cool completely. Ellen said it served 12 but don't count on it. Everyone will want another slice. And that, Levelers, is my Julie & Julia-inspired recipe blog. As I pick up good ones in my travels, I'll share them. Curacao - that's pronounced CURE-a-sow - is one of the most interesting islands you can travel to in the southern Caribbean (it's 38 miles from Venezuela). It's not all flat, but most of where you'll want to go is so it is a great destination for levelers. 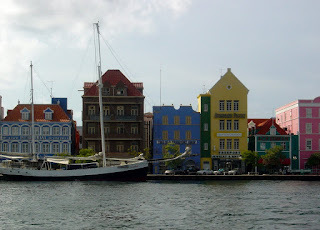 Willemstad, its capital, is split by the harbor but connected by the Queen Emma, a swinging passenger bridge, and continuously running passenger ferries. Punda, where the Dutch-style buildings look like a block of Amsterdam slathered in bright Caribbean pastels, is the most frequented; Otrobanda is more residential and less flat. Tip: If you can handle a few uneven surfaces and elevation changes, Kura Hulanda in Otrobanda is a great place to stay. Walk through either side and around every corner is a vision to remember, a treat for the eyes and lens. Good shopping, too. Tip: Don't feel like walking? there's a town tour by trolley train. 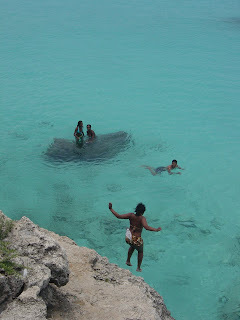 In addition to the expected exquisite blue water and sandy beaches, there are enough cultural layers to rival an onion. The island, once a center of the slave trade where captured West Africans were sent to plantations to be "taught" to be slaves, is now a living example of tolerance. You'll find the oldest continuously operating synagogue in the Western hemisphere, the world's largest museum of slavery and a truly welcoming attitude. Bon bini! - "Welcome!" in Papiamentu, the local Creole patois that blends English, Spanish and Dutch - is even on the island's license plates. It's easy to take in both town and beaches. Better hotels in town provide shuttle service to beaches, beach resorts shuttle guests to town. Tip: All beaches here are public, including those developed by hotels and resorts. Buy a drink or a snack and you'll be welcome to use the facilities. Speaking of which, the food is great. Don't miss the native dish Keshi Yena, kind of a meat and veggie pie in cheese, at Blues, the beach-front restaurant at the Avila Beach Hotel. One new amenity is medical tourism. There's a dialysis clinic near the Otrobanda waterfront where guests can spend the night, get their treatments while they sleep then enjoy a vacation like everyone else. This is one island that is a worthy destination. It warrants a much longer stay than cruise ships allow. If relaxation tops your to-do list, consider making a transatlantic crossing. It's the perfect Leveler travel. Imagine, six days at sea, no demands, no phones, all the distractions you want and none that you dread. Planned activities galore if you want them, an ocean of waves to contemplate if you don't. Great entertainment and 24-hour food. Naps count as activities! Cunard's Queen Mary 2 is the only liner making such crossings on a regular basis and she's a beaut. One of the prettiest libraries afloat or ashore, wonderful bands and tea dances and the kind of evening ambiance rarely seen anymore. Daytime is casual but dinner is an occasion. After six, you will dress for dinner: coats - no ties - for men the first and last nights out, cocktail attire or black tie all others. No shorts or jeans allowed outside of the gym and your stateroom. The Black and White Ball is a special night and passengers do follow the color code. An anachronism? Perhaps, but when your days have been leisurely and relaxed you look forward to making an effort for evening. You are traveling in a classic, civilized mode; live it to the max. Your pet can be too; there's a kennel on board, complete with its own dog and cat loving staff. Tip: Which is better, going west to east - New York to Southhamption - or east to west? Read on. If you look forward to on-deck activities, go west to east. Ship and weather patterns move at about the same speed making for balmier conditions. Prefer to cozy up indoors? Reverse it. Going into the weather patterns, ship and wind combine for 40-knot "breezes" on deck - real hairdo ravelers. Be warned, though. West to east, the weather you leave with you'll probably have throughout the voyage. East to west you'll encounter whatever is heading toward Europe. Tip: For a mote detailed story on a Queen Mary2 crossing, go to WellsWords.com. Traveling through the Hill Country you discover that Texas had its own version of Johnny Appleseed, the Adams family who brought apple trees to Love's Creek Orchards in the town of Medina [MeDEEna]. Adam's Apples' The Apple Store is known for its apple pie, voted one of the South's Best Desserts by Southern Living in 2007. It's certainly big enough: five pounds of apples go into each pie. A whole one costs $22.95, a slice $4 and the aroma is tantalizing. Outside, the nursery carries 16 different varieties of apple trees for sale. Tip: This area is popular with motorcyclists so don't be surprised if on weekends you spot bikes parked next to horses tethered at "downtown" hitching posts. The 200 or so residents ride their favorite mounts to town and join the bikers in shopping and blowing off a little steam. Levelers will find the towns situated in the relatively flat valleys of what Texans refer to as the "Swiss Alps of Texas" - if nothing else, a testament to the Texas tendency toward exaggeration. Kerrville is the arts center of the Hill Country and with 25,000 residents, one of its largest towns. A symphony, live theater, an arts center, the Museum of Western Art, the James Avery Craftsmen's World Headquarters and seven restaurants along the south fork of the Guadalupe River sets it apart from its neighbors. The annual Texas Furniture Makers Show at the Kerr Arts and Cultural Center is well worth a detour. Tip: There are steps, more than most of us would like, at Elaine's Table but the food and view make it worth the effort. Kerrville, like its state, accommodates all types from the artistic to would-be big game hunters. There are 57 exotic species raised at area ranches where hunters pay big bucks to bag their beast of choice. Tip: The YO Ranch is one of the biggest of these trophy guaranted operations and as you might expect, the lobby of the YO Ranch Motel is filled with mounts. If it bothers you to see the head, neck and shoulder of a mother giraffe enfolding her calf emerging from a wall, pick another place to stay. The rivers of Hill Country are particularly scenic with cypress trees lining their banks and enough changes of elevation to ensure that lovely burbling murmur. Trips through the Texas Hill Country often begin in Fredericksburg. The burgeoning wine industry in Texas is centered around the area which its German settlers had already made famous by their beer brewing. Between the two, it attracts throngs of city-dwelling Texans on weekends and Hill Country tourists all of the time. With so many steady visitors, you know there's a lot worth seeing and tasting. Main street, anchored by the popular Fredericksburg Brewing Company where you ought to try the food and a flight of their best brews, is full of Texas chic, wine tasting rooms and trendy boutiques. After lunch there you'll welcome the stroll. Stray a few blocks left or right and you'll find more galleries,historic buildings and homes, the National Museum of the Pacific War and August E's which has to be one of the best restaurants in the state and destination-worthy all by itself. Hop in the car and tour the country's fastest growing wine region. Don't be embarrassed if you haven't heard about it; as with many European wine growing regions, visitors and the locals consume the lion's share of the finished product. There are 21 wineries from which to choose. Ken Maxwell at Torre di Pietra adds music to the mix on many weekends, Stone House Vineyard's main building is of interest architecturally and a number of vineyards have B&Bs on or near their property. Tip: Fredericksburg is worth an overnight or more. Those vertically inclined can mountain climb in Enchanted Rock State Natural Area while Levelers are savoring wine, wonderful food as well as the herb gardens and lavender producing farms the area is also known for. The Luckenbach, Texas of Willie and Waylon fame is nearby and a big draw day and night, but especially on Friday nights when the dance hall is full. It can be rented for special parties so check the schedule so you won't be disappointed. This is also LBJ territory, another reason to stay awhile, and the Pedernales is the river that runs through it. Tip: If you visit Luckenbach at night, check the rafters over your head. Chickens roost there. The Atlanta Botanical Garden is often overlooked by travelers in favor of other, glitzier attractions - the Georgia Aquarium, Coke, the High Museum, Stone Mountain. Don't. It's well worth a visit any time and particularly now through October when 20 works of renowned British sculptor Henry Moore are nestled among 30 acres nature's beauty. Tip: It's perfect for Levelers. There are a few steps but always ramps are an alternative and while elevations change, it's so gradual you'll hardly notice. Moore in America presents Moore's sculpture as the artist meant for it to be seen - in the open out of doors. 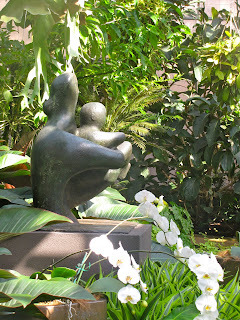 His reclining figures look right at home and his popular mother and child images are an artistic complement to the mothers and their children roaming the gardens. The gardens themselves are lovely. The Dorothy Chapman Fuqua Conservatory and Orchid Center is spectacular with its lush, tropical flora. You and the young ones will love the Children's Garden so save the energy to include it. Best of all, the Atlanta Botanical Garden it's in the middle of the city in Midtown, just north of Piedmont Park on Piedmont Avenue. Admission will set you back $15 - $12 for seniors and children ages 3-17. Tip: If Southern summer heat is too much for you - and it is for most Southerners - visit on Thursday for Moore at Night: Cocktails in the Garden, 6-10 p.m., through September. Come October it's Fest-of-Ale, same hours. This is the largest showing of Moore's work in one place, let alone the best place, you are ever likely to see so if you are in the Atlanta area, don't miss it. Tip: Where to stay. Kimpton's Hotel Palomar is the newest spot in the Midtown area; cool, contemporary but friendly, especially to dogs, and very well equipped. Pacci, the adjacent restaurant, serves superb Italian inspired cuisine. W Atlanta-Midtown, 404-892-6000, on 14th Street is the closest. The Sheraton Atlanta downtown, another pet friendly facility, has undergone a multi-million dollar transformation and with its large, lush pool is especially good if you are traveling with children. If you grew up listening to the tales of Brer Rabbit, Brer Fox, Brer Bear and their cohorts that Uncle Remus told to the Little Boy, you'll want to travel to the Uncle Remus Museum in Eatonton, GA, a pleasant and easy drive north from Macon. If you've never heard anything of Uncle Remus except that Harris' books of his tales are considered politically incorrect, you ought to stop and pick up a book to decide for yourself. Personally, I'd hate to think of these richly evocative tales of African folklore being lost to posterity, which they probably would have been without Harris popularizing them. The dialect, which many find offensive and demeaning, is one of our few links to the language and ingenuity of generations of involuntary American immigrants. The small museum, made from three slave cabins, is in Turner Park right in the center of this pretty town which was the birthplace of Joel Chandler Harris. The park was part of the original home place of Joseph Sidney Turner, the "Little Boy". Harris chronicled the folklore of African slaves at Turnwold Plantation where, at the age of 13, he was hired as printer's devil for the plantation newspaper, "The Countryman." The Civil War and General Sherman's army ended Harris' job, but he went on to an illustrious career as a journalist. The museum features artifacts from Harris' life, Civil War era Southern life, the development of the Uncle Remus tales, the Disney movie about them ("Song of the South") and 12 charming vignettes from the tales carved by Frank Schnell. It won't delay your trip by much and you can arrive in Atlanta in time for a late lunch. Tip: Or, you can cut over to I-75 and stop at Buckner's on Bucksnort (!) Road in Jackson, a stomach-filling tradition for 29 years. The barn shaped and sized eatery is open from 11 a.m. to 8 p.m. Thursdays, 11-9 Friday and Saturdays and 11-7 on Sundays. You'll be seated at one of the large round tables for a family-style, all-you-care-to-eat meal of downhome Southern style cooking. Each table is centered with a lazy susan on which are piled bowl after bowl of delicious fried chicken, green beans, fresh beans or peas and coleslaw, rolls and cornbread plus a so-so peach cobbler. These are augmented, depending on the day and season, by BBQ pork, roast beef or ham, potatoes in various styles, Brunswick Stew or stewed tomatoes, cream style corn or boiled cabbage. The cost is $13.95 for adults, $12.95 for "60-year-old recycled teens," $3 for youngsters ages 3-8. The experience is memorable. Museum and eatery are both totally level. Cannonball House is one of many historic homes in Macon. For years I and too many others have traveled by Macon en route to Atlanta via I-75, never taking the time to stop. It won't happen again. Macon is well worth a two-or three-day stay. The city is large enough to offer a lively downtown yet small enough that you can still find a parking place. The first thing you notice is its beauty. Macon wasn't on Sherman's route through Georgia so it wasn't burned down which means 70 of those elegant antebellum homes are still being lived in. Newer additions have been blended in and the city is an architecture lover's dream. Warning: The Macon Plateau is where Georgia starts getting hilly but you don't have to navigate them by foot if you don't want to. Just park nearby. A lot of history has occurred in Macon. People have been living here since the Ice Age. Towns of giant earth lodges and burial grounds can be explored at Ocmulgee National Monument. When the first Europeans arrived, beginning with Hernando de Soto in 1540, this was a thriving area with planted fields, stockaded villages and impressive earthen structures. Tip: Stop by the attractive Visitor's Center downtown to get an overview of what the city has to offer. While there, pick up a Self-Guided Tour Map and tickets for the Historic Homes Tour and/or the Museum District Tour. Macon soon became an inland trade center with all the advantage wealth brings, from architecture to the arts. This is where the genius poet-musician Sidney Lanier was born and developed his remarkable talents. The Sidney Lanier Cottage has triple landmark status - it is on the National Register of Historic Places, a Landmark of American Music an a National Poetry Landmark. Tip: Schedule your visit when Marty Willett is on duty; he's a one-man show with encyclopedic knowledge and fun anecdotes about Lanier and Macon. What Lanier began, the likes of Graham Jackson, Jessye Norman, Gladys Knight, Little Richard, Gertrude "Ma" Rainey, Ray Eberle, Harry James, Travis Tritt, Trisha Yearwood, Otis Redding and the Allman Brothers continued, as you can learn at the Georgia Music Hall of Fame, if state budget cuts don't close it (www.georgiamusic.org). Tip: By all means catch lunch at the H & H , the landmark soul food restaurant where "Mama Louise" Hudson kept the Allman Brothers fed during their early "poor" days. African American culture is celebrated at the Tubman African American Museum which was named in her honor even though that revered woman had no Macon connections. With its collection of art, history and culture it's definitely worth a visit. Regardless of your skin tone, you'll be amazed at the inventions and products - fire extinguisher, push lawnmower, collapsible ironing board - developed by African Americans. Currently in modest and cramped quarters, a new building is under construction in the Museum District. Tip: The elegant 1842 Inn, a four-diamond, four-star property built - you guessed it - in 1842, is the place to stay. You'll love breakfast, cocktails and canapes and a mint julep nightcap served in front of the cozy fireplace. Be sure to ask for a first floor room because there is no elevator. Come spring, you'll know why several of Macon's streets have pink cherry blossoms on them and a pink line between the yellow stripes. With 300,000 - those zeroes are no mistake - cherry trees, Macon is the cherry blossom capital of the world! Can't wait to travel back there to see them. Charming to look at, engaging to visit, by all means travel to and stop in Macon. You'll be glad you did. Oscar and his goats know when Jane is in the window, treats are in store. 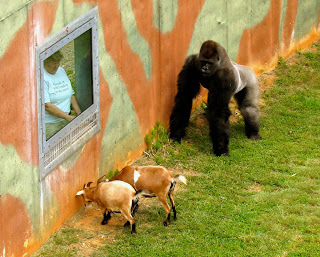 Gorilla Haven is a remarkable facility developed by Jane and Steuart Dewar in Morganton, GA., between Blue Ridge and Blairsville, and for a brief period you can travel inside its gates. Jane envisioned a home, not unlike their original environments, where captive gorillas could be placed while better arrangements could be developed or found. Steuart, a genius at inventing, creating and building better mousetraps, made it happen on a level that no individual zoo or animal park could imagine or fund. At the moment there are two gorillas loving life in their Haven: Oliver, a profoundly deaf but gentle and handsome giant who shares his compound with a pair of goats, and Joe, the third oldest gorilla in captivity, whose condition is a testament to the Dewars' quality of care. With no outside funding and zoos too financially strapped to participate, the Dewars have begun opening their Haven to visitors for limited tours. Dates for this year are Sept. 5 and 9, October 10 and 14 and Nov. 28, all for 2-3 hours beginning at 11 a.m. Cost is a $50 donation per per adult, with a discounted family rate possible. Tip: The terrain is mountainous, you'll be walking on gravel roads and there are flights of stairs to be climbed, but the experience is so unique it's worth pushing yourself. Bring your walking stick and of course, camera and video cam. Contact Emily Moreland at 706-851-9440 or Email angelofahhs@live.comangelofahhs@live.com. This could be your last opportunity to see these magnificent creatures. Oscar may be relocating to a gorilla family in a zoo this winter and Joe is defying veterinary science living as long as he has, but with extensive medical issues including a heart problem, no one knows for how much longer. You'll never forget the delicacy with which these giants reach for favorite morsels of food. Or the thrill of experiencing the noise, power and stunning speed when Oscar decides to show off. If you can't travel there in person, do learn more about this remarkable facility. Around Back at Rockys Place in Dawsonville, GA., is one of the best and most intriguing galleries of folk art you'll find traveling in the Southeast. Begun by a pair of art collecting school teachers in their backyard, it displays the work of more than 200 artists, many recognized by major museums such as the Smithsonian Institute and awarded grants by the National Endowment for the Arts. They work in all sorts of mediums - paintings on tin, "found" objects sculpture, paintings using caulking on board, wood of all varieties, fabrics, clay and glass. The art is everywhere you look - overhead, under foot, in trees, on shelves and walls, in cases, leaning against buildings, on the ceiling, in the bathroom. You won't be able to pull yourself away from the visual overload and when you start hearing the stories about these creators, you won't want to. Dare you not to buy something. I lost the dare but gained a double-headed alligator bench by J. L. Nippers. Tip: No steps either. Rockys Place is open on weekends and by appointment and can be found at the intersection of Hwy 53 East and Etowah River Rd. You can day trip there from Atlanta and you can't miss it. 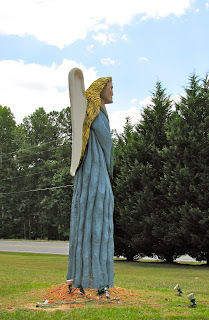 Just look for the gigantic wooden angel out front. After feeding your soul and sense of humor, feed the body with a gourmet lunch at the nearby Blue Bicycle or a good old greasy Bully burger and hand-cut fries at The Pool Room.